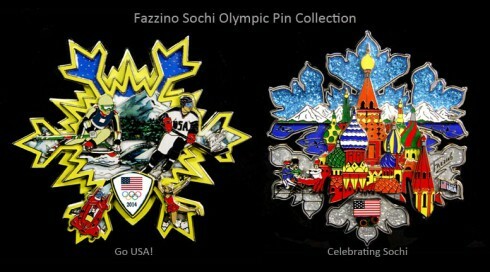 The latest in a long line of Fazzino-designed collectible Olympic Pins are available to order now. To celebrate the upcoming Games in Sochi, Russia, Fazzino has designed two limited production, oversized, 3-D collectors pins: “Go USA” and “Celebrating Sochi.” Each pin is 4″ in diameter, constructed in three-layers, and comes in a felt-lined collectors case with a see-through top. The Fazzino Olympic Pin Collection began back in 2004 with an exclusively-designed line for NBC, the exclusive broadcaster of the Olympic Games. Since then, Fazzino has created more than half a dozen pins, all of which have previously sold out. 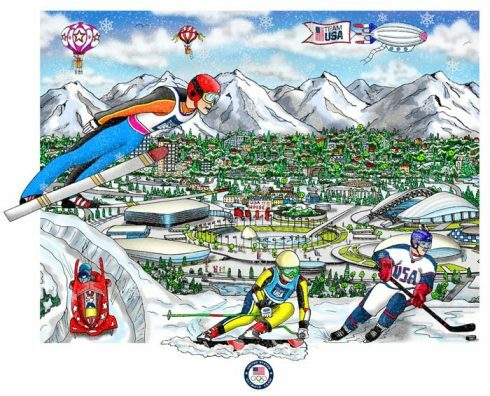 Unlike in past years when the collection was exclusively available through the NBC Olympic Merchandising site, this year’s set is available for direct purchase. We are currently taking pre-orders for this limited production run with fulfillment expected in February. Each pin retails for $59.99 or you can buy the set of two for $110 plus shipping and handling, while supplies last. 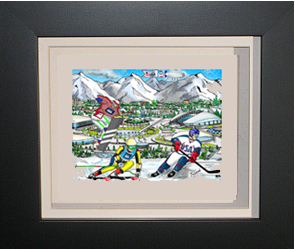 Along with the pin, Fazzino has released both an open edition mini print and a limited edition fine artwork for the Sochi Olympic Games, both of which can be purchased at any authorized Fazzino Art Gallery or email us at info@fazzinocollectors.com for more information.